Franchised kopitiams have been sprouting up faster than you can say lallang after a rainfall. Apart from the usual kopi and teh in the menu, they have taken a leaf out of Starbucks and Coffee Bean and now offer ice-blended concoctions too, albeit with local flavours. One unusual combination is the soya bean milk topped with red bean drink. They blend the soya bean milk with ice, scoop a couple spoonfuls of red bean over it and you slurp it down with a large fat straw. With Chinese new year celebrated over 15 days, there's a lot of celebrating with the family and friends. It is also a cultural norm not to visit empty-handed - so it's usual to bring food or something sweet. I think it is to symbolise a plentiful and sweet year ahead. After a couple of days, I was racking my brain for something new and interesting to bring to the next family get-together. Ta-dah....soya bean milk with red bean! Not the drink, but put together into a layered jelly. Jelly or rather agar-agar is an incredibly versatile dessert and you are only limited by your imagination and creativity. 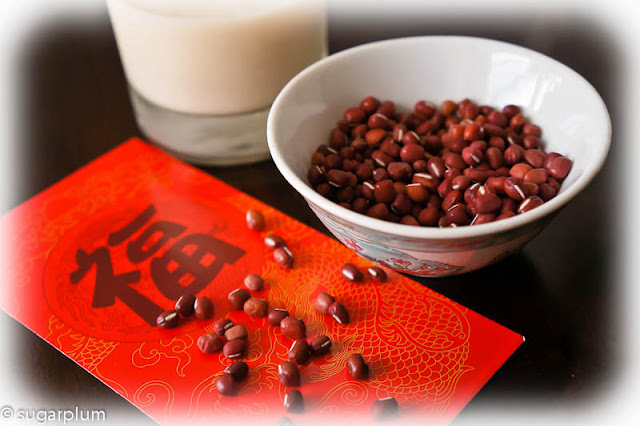 This combination of soya bean and red bean is also visually nice for CNY as it has a deep maroon from the red bean layer. Because it is quite opaque looking, it resembles kuih more than jelly. 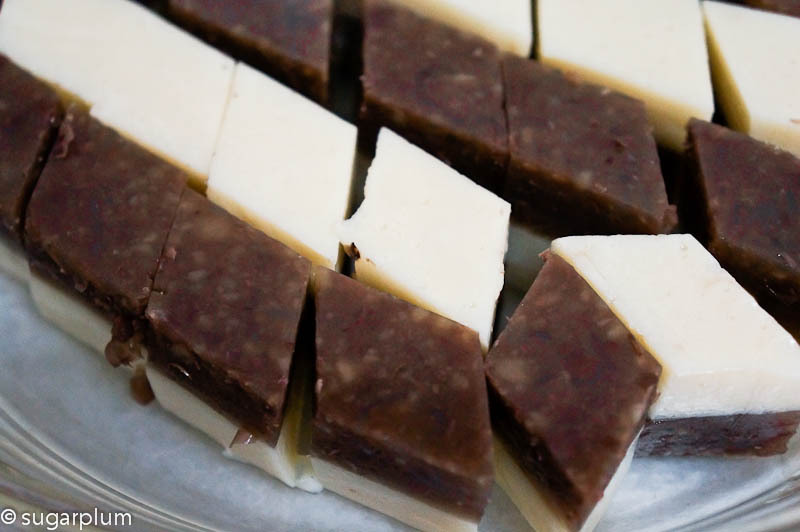 This is a reasonably quick dessert to make. Use ready-to-drink soya bean milk either the UHT variety or the freshly made one from the "tau foo far" stall. Personally the fresh one is nicer. Red bean does take a long time to cook, so I cheat a little. Once they are soft but not yet tender, I blend them first, and then continue the cooking process. By blending them earlier, the smaller particles cook faster and if necessary I blend again at the end. Yes, whatever it takes to reduce prep time. 1. 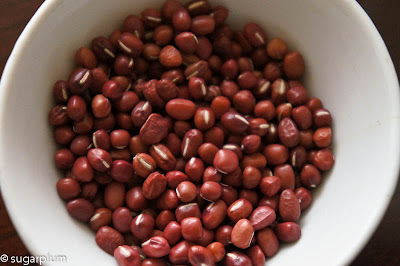 In a small pot, put in enough water to cover the red beans, and pandan leaves and bring to a boil. Simmer for about 45 minutes or until tender. Stir occasionally and add water if necessary. Don't let it dry out as the beans won't cook. Once tender, blend the red bean mixture. Keep aside. 2. Stir 1 packet of agar-agar powder with 250gm sugar. 3. Measure the total volume of the blended red bean. You will need to measure enough water to make up a total of 1 litre of liquid. 4. Place the water in a small pot, add in the agar-agar + sugar mixture and bring to a boil. Do not cover, keep stirring to prevent burning. 6. Once mixture has come to a boil, remove from heat and add in the red bean mixture. 7. Give it a good stir and pour into the mould. Proceed to soya bean layer. 1. Stir 1 packet of agar-agar powder with 3 tbsp sugar. 2. Place the soya bean drink in a small pot, add in the agar-agar + sugar mixture and bring to a boil. Do not cover, and keep stirring to prevent burning. 3. At this point, the red bean layer should have started to set and be slightly firm already. Prick the red bean layer with a fork. This is to allow the soya bean layer to stick to the red bean layer. 4. Pour the soya bean mixture over the red bean layer. Cool and chill in the refrigerator for about 2 hours until firm to touch. 5. To unmould, run a palette knife or toothpick around the edges to loosen before turning it over. 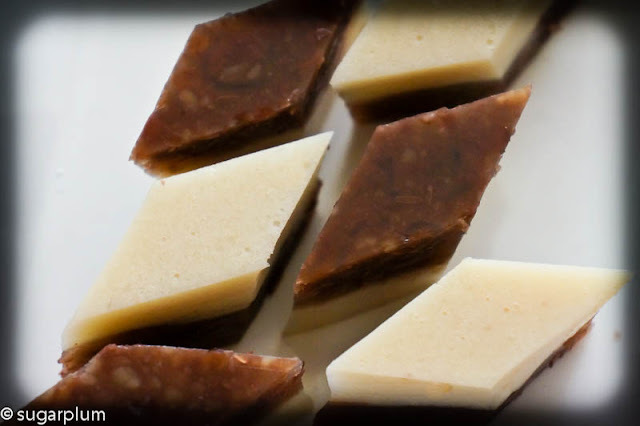 Do follow the instructions on the packet for making agar-agar. It may vary depending on the brand used. The cook time on the red beans is approximate only as some beans take a longer time to cook. Do prick the red bean layer to allow the soya bean layer to stick. Otherwise you will end up with 2 disparate pieces of agar-agar. Random musings about food and travels and about food travels. You'll also see the results of kitchen experiments, usually inspired by someone, or something.